Since 1996, FSHS has been building high quality spot free/reverse osmosis equipment. 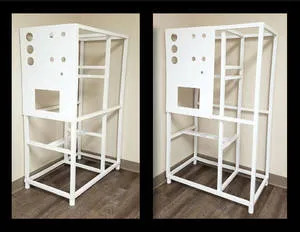 With lab testing, computer design, and engineering, FSHS products simply perform. The company primarily built privately labeled equipment for wholesalers and distributors in the past, but is now offering its line to car wash operators. What’s New/Best Seller • Spot-Free System. Advantages/Features • The spot-free system is as easy as 1,2,3. Simply plug and play, it’s that simple, connect the water and plug it in. This method saves space, energy, time, and money. With proven technology used for over 20 years in municipal water treatment all over the world, the need for a salt system is eliminated while reducing waste. The low energy system can produce 30 percent more water with 50 percent less electricity. Save time on installation and service while saving money through lower start-up costs, lower maintenance costs, reduced energy bills, and reduced water bills. Carolina Pride Carwash Systems & Solutions has been providing car wash operators throughout North America with industrial grade wash systems for over 50 years. Carolina Pride offers many services, including car wash payment and management systems, Turbo Dry, Performa, Express, and the newest OPTIMAX Series of self-service wash equipment. The company’s tunnel solutions line of equipment includes the popular Solution Control Center and Motor Control Centers, spot-free rinse systems, vacuum stanchions, and an online car wash academy. What’s New/Best Seller • Super Flo-R.O.-N Spot Free Rinse System (no water softener required). Advantages/Features • The Super Flo-R.O. 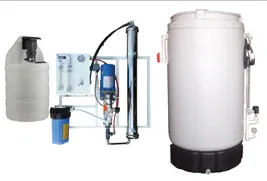 system features a carbon tank with auto back flushing head, production and reject flow meters, a pre-filter, and a TDS meter that treats 2,200, 4,400, 6,600, 8,800, or 13,000 gallons of water per day. Easy access panel for servicing both a wall- or stand-mount system. Systems come in three delivery options: Super Flo-R.O.-N (no water softener needed), Super Flo-R.O.-C (with water conditioner), and Super Flo-R.O. (requires water softener). Coleman Hanna Carwash Systems has been a leader in the car wash industry for over 50 years, providing expert knowledge in manufacturing quality equipment as well as creating innovative products that enhance the car wash experience. What’s New/Best Seller • Sweetwater Bio Reclaim System. Advantages/Features • The Sweetwater Reclaim System comes in base units of 90 gallons per minute with 16 cyclones. This unit comes standard with patented bag filters used to get the microns down for use in the high-pressure piston pumps. The Sweetwater Reclaim System has the option of an ozone filtration that is fed with pure oxygen and bio filtration. Serving the vehicle wash industry for over 30 years, Con-Serv Manufacturing is a leading distributor of quality water systems. From reclaim and spot-free systems to pressure boosting and water storage ideas, Con-Serv has a solution for all needs, offering economy without compromise. What’s New/Best Seller • Versatile CSRO Frame. Advantages/Features • The CSRO floor stands add value to the company’s popular reverse osmosis unit. The versatility of mounting the gauge/control panel onthe “long” or “short” side of the frame gives the customer the flexibility to place the unit in many locations in an already crowded equipment room. The frames are coated with a durable high gloss, white powder coating to ensure long life and like new appearance. The new design gives easy access to vital components no matter the orientation. Customer/Operator Support • Support offered through a worldwide distribution network as well as from Con-Serv ensures satisfaction from installation to operation of the product. Toll free: (800) 868- 9888. What’s New/Best Seller • SONNY’S ERS 100 Reclaim Water System. 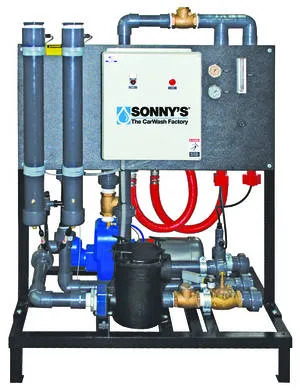 Advantages/Features • SONNY’S ERS 100 Reclaim Water System delivers desirable, patented odor control and function at an economical price. The system filters particulate matter with its double hydro-cyclonic action. Automatic fresh water overrides in the event of low water or low flow. 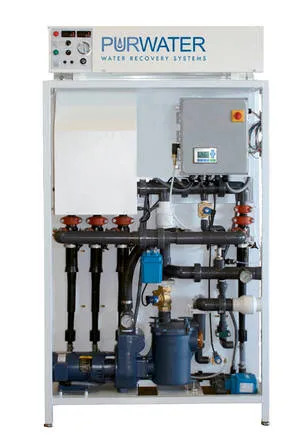 Features include: single pump operation; UL listed control panel; easy retrofit application; low maintenance, accessible components; TEFC, self-priming pump; two pump pressure gauges; and air flow meter. Blendco Systems has developed a better way to treat and reuse water without the complications of filters and ozone-generators. What’s New/Best Seller • SuperClear System. Advantages/Features • SuperClear is a filterless approach to cleaning water. It harnesses water’s natural ability to drop out dirt and contaminants and exponentially accelerates the process through the use of chemistry. The system uses a proprietary coagulant, Combine 100, to attract microscopic dirt particles and combine them into larger soil complexes. It takes these heavy dirt complexes and accelerates their fallout using Drop Out 200 flocculent. The system automatically separates clean and dirty water. SuperClear Odor Gone 300 and/or the SuperClear Recirculating System disallow anaerobic bacteria to thrive on soils, thereby eliminating odor in the recycled water. 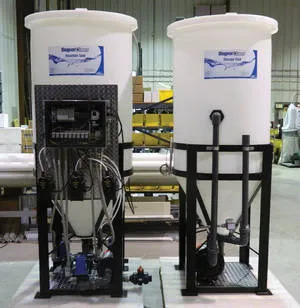 In addition to the Water-Wise Water Treatment System, Washworld Inc. manufactures the Razor and Revv touch-free wash systems, and Profile soft touch wash system. What’s New/Best Seller • Water-Wise Spot Free Reverse Osmosis System. Advantages/Features • The Water-Wise RO system is manufactured for maximum efficiency. The unit features a backwashing activated carbon filter; 5-micron melt blown cartridge style pre-filter; and thin-film, high-efficiency membranes in stainless steel housings. The system also includes integrated electronically monitored low-level and low-pressure protection and can be floor standing or wall-mounted. Available in three stock sizes of 2,400 gpd, 4,800 gpd, and 7,200 gpd. Customer/Operator Support • Technical support is available on a 24-hour, 7-day-a-week basis. Aqua Bio Technologies is a leading manufacturer of biologic water restoration, water reclaim, rain harvest, and odor control systems. Systems do not use any ozone, UV, or chemicals of any kind to control odor — only nature. Aqua Bio systems give customers the results they desire — clean water, no odor, and dramatic reductions in water and sewer costs. What’s New/Best Seller • Pro-Limited 160 Water Reclaim System. 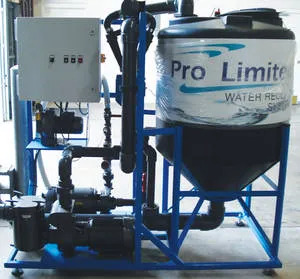 Advantages/Features • The Pro-Limited system uses aeration, cyclonic separation, and centripetal storage for reuse in the wash. No ozone or chemicals of any kind, therefore no expensive replacements and/or repairs. The Pro-Limited system is virtually maintenance free only requiring one annual air filter replacement. Systems comes in 20, 40, 60, 80, 100, 120, 140, and 160 gpm. 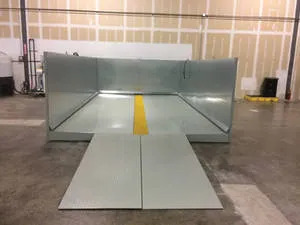 The unit only has a 3’x 6’ footprint, comes pre-plumbed and pre-wired, and can be used in any type of car wash.
Customer/Operator Support • Local knowledgeable distributors are available. 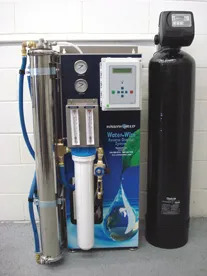 Hydro-Spray’s H2O Reverse Osmosis System produces high quality permeate water (spot-free water) with a low total dissolved solids (TDS) make-up in both automatic and self-serve applications. The spot-free rinse system was designed with an emphasis on simplicity, flexibility, and reliability. It is continuously monitoring the water quality, pressure readings, and holding tank fill level to operate the system safely and easily. What’s New/Best Seller • Reverse Osmosis (Spot Free) Rinse System. Advantages/Features • Features of the spot-free system include: high efficiency low-pressure membranes; automatic inlet water shut off valve; cartridge pre-filter housing; low feed water pressure pump protection switch; multi-stage centrifugal RO pressure pump; pressure/recycle/reject control valves and manifold for accurate setup; panel mounted system pressure gauges; RO permeate and RO reject panel mounted flow-meters; and NEMA 4x system controller with microprocessor based RO controller. 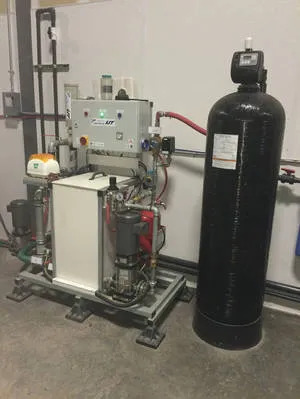 The powder-coated, corrosion-resistant welded carbon steel frame, stainless steel RO element pressure vessels, and non-corrosive HDPE control panel ensure years of continuous service. Reclaim Equipment Company designs and manufactures state-of-the-art water recovery and treatment systems, reverse osmosis spot-free rinse systems, reclaim-ready high-pressure pump plants, chemical injection manifolds, and custom equipment for the car wash industry. What’s New/Best Seller • Water Reclamation Equipment. Advantages/Features • The company’s reclaim equipment significantly reduces water bills and access charges. The systems provide clean, odor-free water with extremely low maintenance and low operating costs. The high-pressure pumping systems have reliable diaphragm pumps with tank level sensors and controls. Customer/Operator Support • The company offers design consultation, installation, service, and parts. Velocity Water Works designs and manufactures performance water systems and provides services to solve water issues. Velocity was founded on the idea that the success of its customers is paramount to the health of Velocity, and this is carried out through every step of the process. 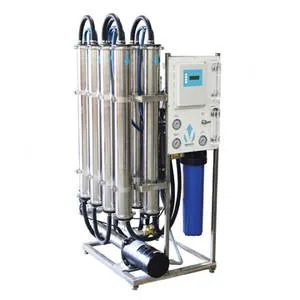 What’s New/Best Seller • Velocity Water Works Free Standing Reverse Osmosis Systems (Model VROF). Advantages/Features • Designed by experts with over 30 years of collective experience. Only the finest components are used, right down to the stainless steel frame. 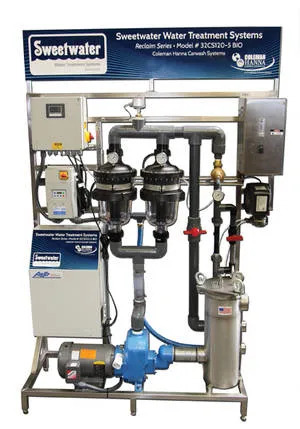 Production capacities cover any application, from 1,800 gpd up to 28,000 gpd, and the state-of-the-art VROC RO control digitally displays TDS and system performance status along with automatic membrane flush, low pressure safety shut-off, and automatic system restart. The carbon filter comes integrated into the RO frames of 9,600 and smaller, and the systems also include a production float switch and 1.5-hp repressurization pump with fresh water bypass. Customer/Operator Support • Support is available seven days a week. Since 1984, Pur-Clean Spot Free Rinse Systems has supplied car wash operators nationwide with quality, spot-free water, assuring a perfectly clean, spot-free vehicle every time. What’s New/Best Seller • Pur-Clean Spot Free Rinse Systems. Advantages/Features • The Pur-Clean system delivers spot-free rinse to the vehicle at the conclusion of the wash process. The system displaces all residual city and chemical or mineral-laden water, (including reclaim water) and allows the entire vehicle, including glass, chrome, and painted areas, to dry perfectly spot free. All systems are ETL tested and approved, and are manufactured with the finest components — including the state-of-the-art WaterStabilizer pretreatment system. The WaterStabilizer effectively addresses water hardness without the use and ongoing expense of a water softener. The system is a passive technology, environmentally friendly, and never requires replacement or ongoing chemicals to operate. Pur-Clean systems work with full-service, exterior tunnel, self-serve, and touch-free automatic car washes. PurWater Recovery System has been an industry-leading provider of water treatment solutions for the professional car wash industry for over 25 years. What’s New/Best Seller • The PurWater Recovery System. Advantages/Features • The self-purging filter technology is a totally physical process — eliminating the need and ongoing expense of bags or disposable filters, while consistently providing clean/odor-free, high-quality 5-micron water. A programmable logic controller with variable frequency drive provides efficient, cost-effective operation. The system integrates ozone odor control technology — effectively eliminating bacteria growth, the source of offensive odor. Several models are available and can easily be incorporated into full-serve tunnel, express tunnel, in-bay friction, and touch-free wash applications. Systems come pre-wired/pre-plumbed, and the minimal 16” X 48” footprint makes it perfect for retrofit installations. Customer/Operator Support • Factory trained/authorized distributors assure quality and satisfaction. Delivery/Installation • Orders ship in five to six days. Professional installation through a national network of factory trained and authorized distributors. Price • Competitive pricing available upon request. NS has been an innovator in the vehicle wash industry since 1961, leading the way with a line of tunnel wash modules, components, and drive thru fleet systems that are sturdy, efficient, and easy to operate. What’s New/Best Seller • Above Ground Clarifier and RO Systems. Advantages/Features • The Above Ground Clarifier is designed to condition used wash water by removing floating contaminants as small as 30 microns. The water can then be safely sent down the drain or better yet, to the Above Ground Reclaim System. 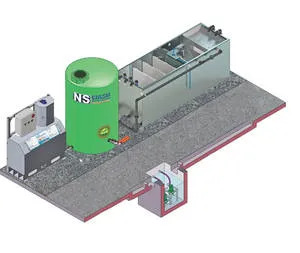 The NS Clarifier can easily be adapted to any existing wash; from car washes to bus and train installations. The system features lower operating, water, and sewer costs and multiple filtration with reusable filters. Forget fouls smells and problems with groundwater contamination. Customer/Operator Support • NS Wash Systems has a worldwide service and distribution network. Freylit designs, manufactures, and distributes environmental technology systems for the treatment of waste-water. The company has over 30 years of international experience and installations in more than 35 countries worldwide. What’s New/Best Seller • EKOLIT MF Reclaim Systems + Drop Down Wash Pads. Advantages/Features • The EKOLIT range offers 8 to 300 gpm models that provide odor free, clean water with low operating costs. 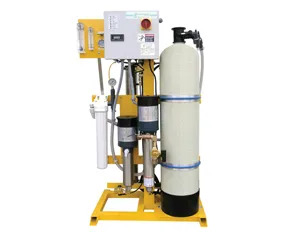 Freylit’s reclaim systems do not use corrosive ozone or dangerous chemicals, and incorporate automatic self-cleaning filters that eliminate messy and expensive filter replacement. Metal drop down wash pads make an easy and quick install. The EKOLIT range is robust, field tested worldwide, and by incorporating Freylit’s oil water separators and polishing filters, can handle even the toughest closed loop site/application.